Your shoulder is made up of three bones: your upper arm bone (humerus), your shoulder blade (scapula), and your collarbone (clavicle). The head of your upper arm bone fits into a rounded socket in your shoulder blade. This socket is called the glenoid. A combination of muscles and tendons keeps your arm bone centered in your shoulder socket. These tissues are called the rotator cuff. They cover the head of your upper arm bone and attach it to your shoulder blade. Excessive ball throwing or other overhead activities during work or sport can lead to acute tendinitis. Degenerative diseases like arthritis or repetitive wear and tear due to age, can lead to chronic tendinitis. Shoulder pain can also result from arthritis. 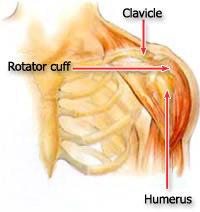 There are many types of shoulder arthritis. The most common type of arthritis in the shoulder is osteoarthritis, also known as “wear and tear” arthritis. Symptoms, such as swelling, pain, and stiffness, typically begin during middle age. Osteoarthritis develops slowly and the pain it causes worsens over time. Arthroscopy. In this surgical procedure, your doctor looks inside the joint with a fiber-optic camera. Arthroscopy may show soft tissue injuries that are not apparent from the physical examination, x-rays, and other tests. In addition to helping find the cause of pain, shoulder arthroscopy surgery may be used to correct the problem.